It might be a sorry part of our aging process but we realized that it’s been a while since we last did even a moderate cross-country hike. It has also been raining in recent months thanks to the typhoon and southwest monsoon season. However a break in the weather earlier last week finally gave us a chance to trek to a waterfall in the forested highlands of Siniloan town in Laguna. 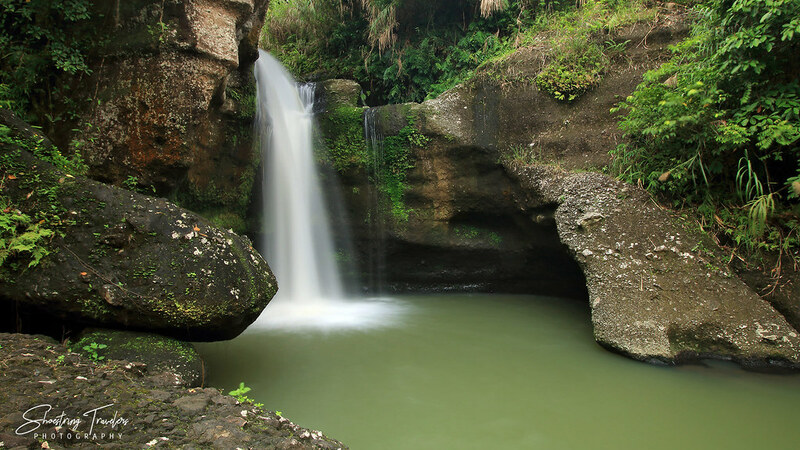 Siiniloan is known for its waterfalls in the Mount Romelo area including Buruwisan, Sampaloc and Lanzones Falls. But there are about a dozen other known waterfalls here. Locals have also said that there are even more located in the remote forests and hills above the town. Not too long ago we read about the waterfalls in Bgys. Magsaysay and Llavac near the boundary with Real, Quezon. These falls are located not too far from the Famy-Real-Infanta Road. Eventually we set our sights on Tulay na Bato Falls. Getting to Tulay na Bato required going first to Trekkers at Km. 17 on the Famy-Real-Infanta Road. Trekkers lies inside the 10-hectare property of Ms. Luz Zaldivia, a retired lawyer and consultant, with whom we had a nice and long chat before heading out. Her caretaker and usual guide – Ka Laoyan – was out on an errand so Tita Lucy provided us with a teenage guide instead. A large portion of the trek took us through her coffee plantation located inside a forested area. LEFT: Trekkers – the house of Ms. Luz Saldivia; the gate on the right of the photo leads to the trail to Tulay na Bato Falls. RIGHT: The Trekkers sign on a tree by the side of the road. The first part of the trek was a steep descent through a narrow trail, which although somewhat slippery due to recent rains, wasn’t too difficult. After this the trail had only gradual ascents and descents with crossings over two small streams. We’ve been forewarned about leeches (local limatik) in streams that we would pass but fortunately we didn’t encounter any. The last part of the trail – about a third of the way – was the most difficult. The trail at this point had been overgrown with shrubs and vines. Leo ended up with a small cut in his leg from a sharp twig; having a bolo knife to help cut our way through would have been handy. Genmar, our teenage guide, said that there have been few visitors the last several months so that this part of the trail has been rarely used recently. There was a steep ascent followed by a final descent through huge and slippery boulders which we handled by simply being patient and careful. The end of the trek brought us to Tulay na Bato Falls at last. Huge boulders surround this waterfall, the same kind that made our final descent the most difficult part of the hike. 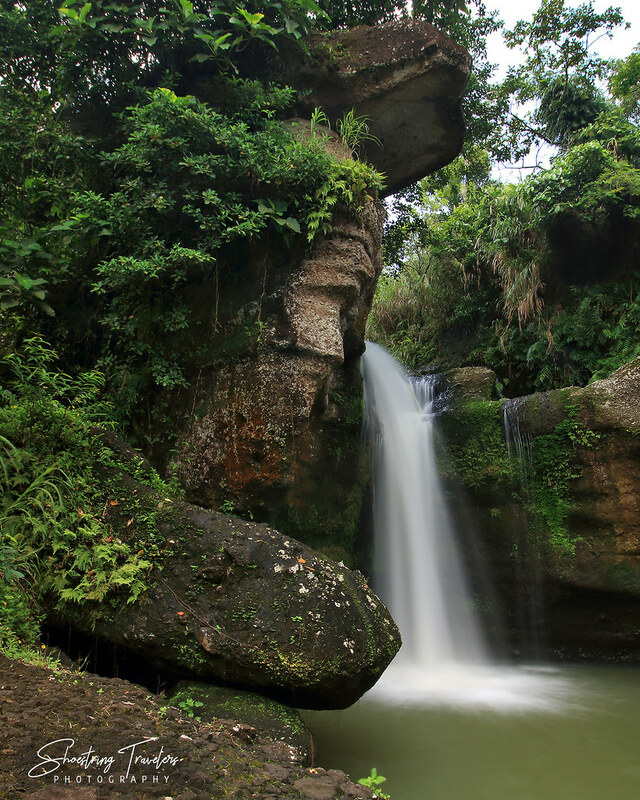 On the left side of the falls is a naturally sculptured rock formation with a huge slab protruding over it – shaped much like a hammerhead – that towered way above the waterfall. The catch basin is not that big but was still deep enough (20 feet at its maximum) to allow diving. This pool then flowed into a short but wide cascade downstream. 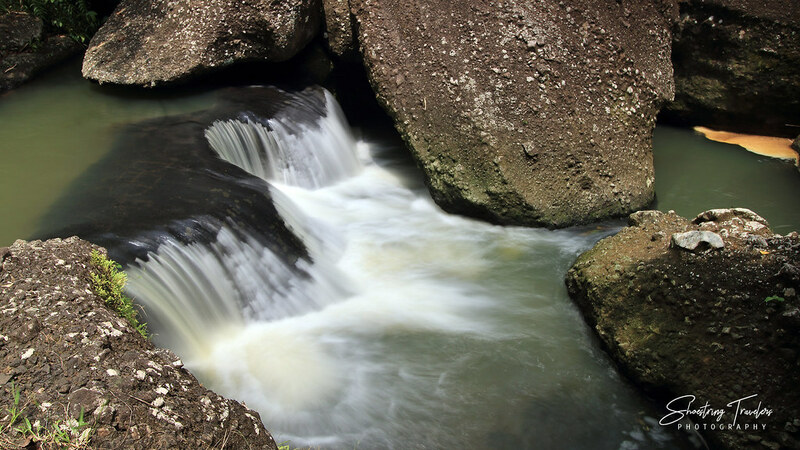 About a kilometer away, the Llavac River descends into a series of spectacular cascades, discharging over several large rocks – the Hagdang Bato Falls. It was tempting to visit Hagdang Bato but our guide said the hike going there was even more difficult plus it was almost lunchtime. Time to go back. With Siniloan just a 2.5 hour drive from home, we can easily come back for Hagdang Bato and nearby Kalawang Falls in the near future. By public transpo: There are buses (such as Raymond Bus) and vans in Metro Manila (at Taft in Manila or Cubao in Quezon City) that are bound for Real or Infanta, Quezon. These will pass by Trekkers on the Famy-Real-Infanta Road. Trekkers is located about 14.5 kilometers from where the Famy-Real-Infanta Road leaves the Manila East Road (the main highway on the eastern side of Laguna de Bay). It lies on the left side of a bend on the road and there’s a small sign on a tree to identify it. If coming from the southern side of Laguna de Bay or via the South Luzon Expressway, take a bus to Santa Cruz in Laguna. At Santa Cruz take the jeepney to Siniloan town (jeepneys pass in front of the bus terminal at Sta. Cruz). At Siniloan take a tricycle to Bgy. Magsaysay and tell the driver to drop you off at Trekkers. By private vehicle: Trekkers is situated at 14°29’54.4″N 121°31’03.4″E on the map (see above). Directions using Waze or Google Maps are simple once you get to the Manila East Road. At Trekkers look for Ms. Luz (Lucy) Zaldivia. Tita Lucy will orient you about the area and will provide a guide for the trek once you register. The trek to Tulay na Bato may be packaged with a trek to Hagdang Bato Falls. The Tulay na Bato hike usually comes first and can take anywhere from 30 to 40 minutes. Hikers continuing on to Hagdang Bato are guided on the way back to a different and shorter trail that eventually leads to a different exit point at the Famy-Real-Infanta Road. The guide rate varies from P250 to P300. Posted in Laguna, Travel PhilippinesTagged calabarzon, hiking, Laguna, Siniloan, trekking, Tulay na Bato Falls, waterfallBookmark the permalink.